Porcelain? These marbles are HEAVY. So, I just had to see what was inside some marbles that I've had for over 10 years. I chose one that was one of the smallest (and slightly out-of-round), put it in a vise and hit it with a hammer a few times. They're quite hard, too. Inside looks like and feels like glass. As I stated in the title, these are HEAVY for their size. LEFT PHOTOGRAPH: The middle marble is the one that I hit with a hammer a few times. I know that the marble in the middle doesn't show much of the internal glass, but it is there. The marble on the far right is white-green with a strip of metal on the surface. The far left marble is the pink-blue-tan-white one. RIGHT PHOTOGRAPH: The two marbles on the left (now looking at the right photo) are the same two in the left photograph. 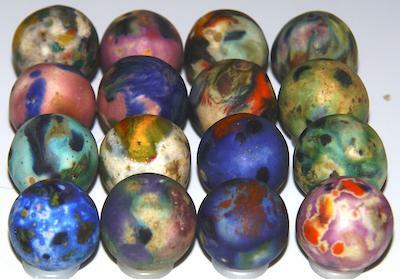 The far right marble (blue-brown-white with red-green-white spots) is one of the marbles in question. For comparison in weight, I chose one of the marbles in question and then found a Marble King of the exact same size. They both measure 25/32". The Marble King weighs 32 grams and the marble in question weighs 61 grams, almost 2X the weight of the same size Marble King. Marbles like those started showing up with the Atlanta marbles (the stars and the magic marker marbles). I don't know what the origin story is for your marbles -- not the real story and not the story anyone told when selling them. The consensus has been that they're relatively new. It sort of looks like enamel to me. Any chance someone put an enamel finish on the industrial ball mill balls which were used to make the Atlanta marbles? I'll take a few photos and upload them. I like your weight comparison. That's interesting stuff. Here's a sampling of the 25/32" marbles that is in the title of this thread. No two are alike. Do you have a meat tenderizer hammer? The kind with lots of sharp points. I want to bash one with that! I'm still thinking ball mill ball, because of the weight, but I would want to keep trying to chip off that outer layer. All fake. Probable painted colored ceramic mill balls. If so they are super hard and will be hard to break let alone chip. Think the ball mill balls were made of corundum, fused aluminum oxide (alumina). 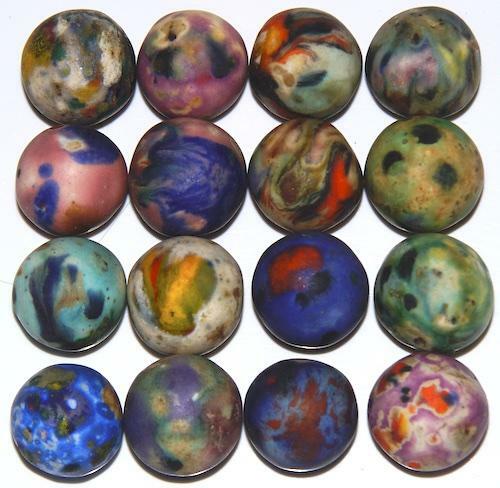 About a decade ago, someone was making and selling on eBay decorated fused alumina marbles. I forget his name. The decoration was his own style and marbles were inexpensive. No intention of deceiving anyone. 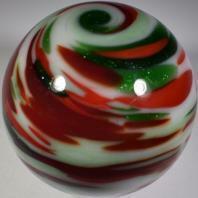 Is the decoration on your marbles only on the surface, or is the color incorporated into the body of the marble? So, somehow the material of the mill ball itself was used to give that enamel-looking effect? Corundum mill balls are molded and heat fused for strength (sintered). The molding process leaves a ring around the equator. This ring wears down/off as it is used. This is just speculation, but I looks as if someone attempted using enamels to decorate the surface. To make the powder enamel stick to the surface, it is mixed with a wetting agent to become like a paint. The lack of surface porosity of the ball mill resists the attachment or even spreading of the enamel paint. Hence, the splotchy appearance. Once painted, the ball is placed on a 3-point stand (trivet) and then quickly kiln fired. Or just placed on a kiln shelf with release or on a kiln shelf paper.